There’s a certain Sam Peckenpah movie called “Pat Garrett and Billy The Kid” starring James Coburn, Kris Kristofferson, and Bob Dylan. In one scene, Kristofferson mentions a gunfight involving an old buffalo hunter, and calls him what sounds like Us Christmas. It’s a strange name, but they’re a strange band – from Marion, a small town in the foothills of the Appalachian Mountains, western North Carolina USA... U.S.CHRISTMAS started playing together in 2002. Now they are a five-piece unit of Matt Johnson (theremin, guitar), Nate Hall (guitar, vox), Tim Greene (drums), John Presnell (bass), and Chad Davis (synth, guitar). They create very loud, loose and free music in a definite nasty psychedelic vein, but never jammy or amorphous. Everyone creates their own individual sound, and writes their own parts. And together they change things around a lot, probably because they don’t remember what they played the last time they played. The bandmates mention many bands that shaped their sound: classic psychedelic, blues, guitar slingers, modern metal, doom, and sludge, as well as old country artists (Neil Young & Crazy Horse, Hawkwind, Neurosis, Caustic Resin, etc.). They believe that the huge amount of fear circulating around the world comes out in their music, and music is a good way to cancel that out. Fear is a destructive thing, and to destroy it, one has to confront it. And USC really do with uncommon valor, passion and fury! Please be sure to check out U.S. CHRISTMAS MyspaceMusic page. In 2007, the band signed a deal with US label Neurot Recordings. In 2012, Salt The Wound was re-issued by Israelian independent record-label Heart & Crossbone. "For their first real album, the band has taken material from their previous discs and reworked/rearranged/re-recorded them into Salt The Wound, with a sound that combines classic 70's psych rock, Caustic Resin, Neurosis like dirge, gooey sludge metal, blues and early country music, Hawkwind style spacerock explorations, and the expansive fire rock of late 70's Neil Young & Crazy Horse. Quite a heady mix, but Salt The Wound ties these influences and stylings together with a righteously loose energy as the band works out extended riff feasts littered with spacey theremin strains and some of the coolest molten synthesizer woosh this side of Comets On Fire, resulting in 10 jams of awesome life affirming heaviness. At just over an hour long, the band keeps it dynamic and ever changing as they move from the moving, distortion-caked country/space rock sludge of 'Lazarus' to 'Death By Horses' awesome motorik rush, the doomed cosmic boogie of 'Devil's Flower' and 'Thin The Herd' instrumental Southern rock. Trippy, rocking, crushing, this is a stellar first album from U.S. Christmas, presented in a gatefold sleeve with great artwork by Victor Pushkin. HIGHLY RECOMMENDED." – by Adam Wright of Crucial Blast (USA) (January 2007). "They sound freakin' killer. Salt The Wound is a slab of real originality and true art in a world of spineless sap... This is scary, yet remarkably memorable stuff and I love it." – by Ray Dorsey at Chaos Realm (USA) (February 2007). "This is much more interesting than most stoner bands, more adventurous and psychedelic, more bent on letting their guitars float in space instead of entrenching themselves in lo-tune Kyuss homage mode. (Rate: 3,5/5)" – by Hansel Merchorat at Deaf Sparrow (USA) (May 2007). "They are just unlike anything else, while still sounding recognizable. Salt the Wound has a really particular atmosphere. It's dense and extreme but U.S. Christmas don't really play heavy music as much as they play atmospherically heavy music. They do, however, space the hell out all the time... (Rate: 7.9/10)" – by Ignacio Coluccio at Maelstrom (USA) (June 2007). 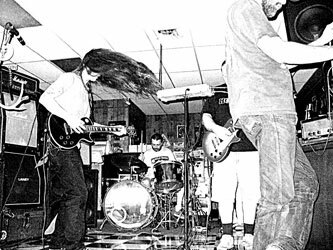 "Fantastic space rock from contemporary North Carolina outfit. Hawkwind influences are there, especially on songs like 'Death by Horses', and it certainly does sound like a completely warped sludgecore band when U.S. Christmas get slow." – at Bomp! Mailorder (USA). The album was also reviewed at: Nota-Bena (Russia), Chopsticks Webzine (Russia), Psychotropic Zone (Finland), Perkele (Italy), Rate Your Music (USA), Deaf Sparrow's interview with U.S. CHRISTMAS (USA).